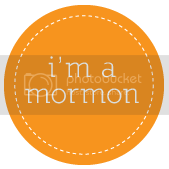 While enjoying the sacrament this morning, Amelia finally put two and two together. Usually, Justin and I will whisper in her ear explaining what the sacrament bread and water are all about. This week we did not have the chance. As soon as she spotted the bread, she pipped up and exclaimed: "Yay, Jesus Bread!!!" Guess she got that lesson down. I am really glad she did not say hosanna or hallelujah! 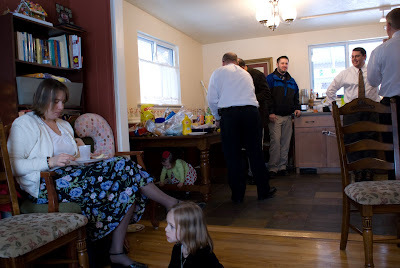 This afternoon Amelia and I went to James and Miekka's ward to see Lia's blessing. Justin went to Haley Call's farewell. She is serving in Portugal! Amelia thought it was great fun to climb over the pews from my arms to Miekka's and back. We had to put to kibosh on that game. 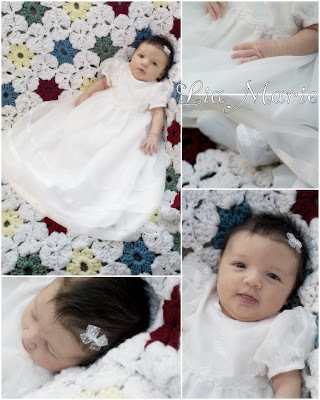 Lia looked so sweet in her white dress and hair bow. James blessed Lia with sweet blessings that will help her throughout life. We are so glad Lia is here and healthy. Miekka and James provided yummy sandwiches for all to eat after sacrament meeting. 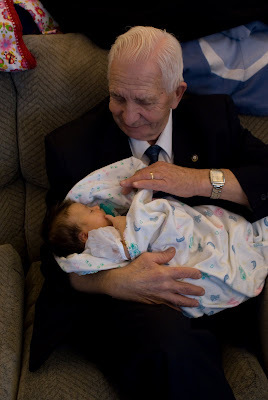 I was so glad to get a picture of Grandpa Baerwaldt holding Lia. Amelia showed off her really neat vocal chords by squealing and running around the roundy, round. She also thought it was neat to scoot her bum on the main beam underneath Miekka's dinner table. 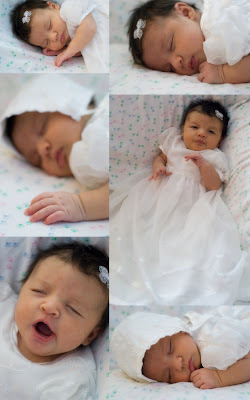 Then of course I had to catch a couple pics of Lia (or 133 to be exact) in her white dress. She looked so cute with her little bonnet on. Eventually she tired of playing and drifted off to sleep, which is the best time to photograph little innocent cuties! Joe came home with us and spent the evening lounging on our couch, eating home popped popcorn, and watching Emma (the Joseph Smith one) with us. Amelia melted like a little snowman soon after he left due to getting only a 10 minute nap. Yesterday evening the power went off for 10 mintues or so. Justin (what a cool nerd) had headlamps not 5 feet away. He jumped into action and supplied us all with headlamps. 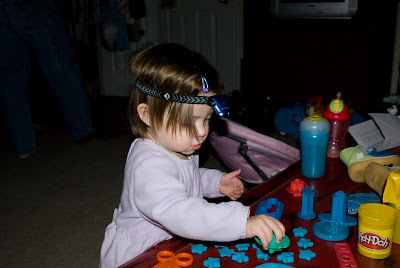 Amelia was delighted to keep making her "tars" in the dark. She kept the lamp on much to Justin's amusement. I made these yesterday for little Lia. Mom got Lia the onesies for Christmas so I spiced them up a bit for some winter cuteness. Justin repaired our basement ceiling yesterday. About three years ago my fish tank sprung a leak and caused the basement ceiling to bulge a bit. Now that we are moving he decided to fix it. LOL. Amelia learned how to climb Seth and Jacob's bunk bed ladder this week. Consequently, the ladder Justin had out was super duper fun to play on. 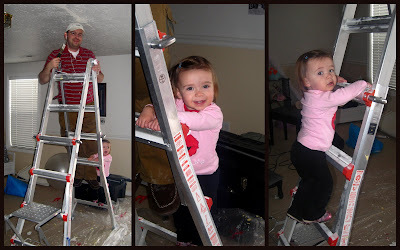 She helped Daddy by misplacing his tools, squeezing by him on her way up and down the ladder, and getting really dusty. My studio is packed away in preparation for our move. Most likely we will rent a storage unit for a month or two to store some of the extra stuff in our house that we don't want out when we show the house. Once it sells we'll have to move it back into our home so the movers can pack it. Yesterday I packed up Christmas. That was really sad because I usually keep out our tree until mid-January. Our only excursion outside was to Blockbuster to rent a movie. Amelia loved running up and down the aisles jabbering at any one who'd listen. Justin and I ended the evening watching the Jack Bauer "Redemption" movie. It made me want to watch 24...too bad there is not a season out for this past year. Dang TV writers strike.